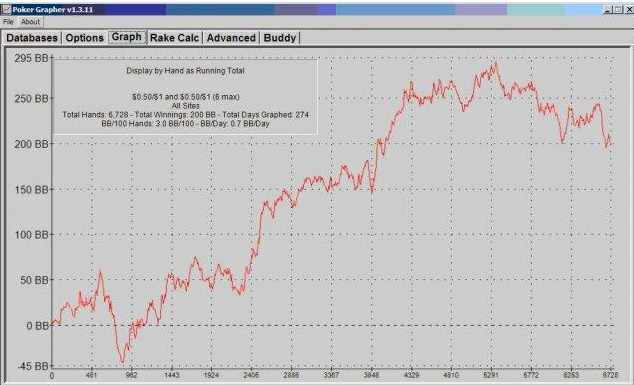 PokerGrapher provides all of the functionality that a poker player could want from a graphing application. You can view your play broken down by date, session, or hand and see how much progress your bankroll is making in dollars or big blinds. It has a clean, easy-to-use interface that anyone can figure out how to manipulate. PokerGrapher also includes several extra features that many people will find useful. PokerGrapher is a powerful tool that should be in every poker player's software arsenal. It allows you to create graphs of your poker play based on information from your PokerTracker database. You can graph your earnings for the day, month, year, or any other sort of date range that you might desire. It is extremely helpful for tracking your progress during the month or year, especially if you set goals for the number of hands you want to play or the amount of profit that you want to grind out. If you are more concerned with your BB/100 win rate, you have the option to generate a graph based on that instead of by the dollar amount. This can be useful for getting a subjective view of how solid your game is if you are playing at several different buy-in levels. There are a few "extra" features unrelated to graphing that are included in the PokerGrapher application. They include a rakeback calculator and "buddy" finder. The rakeback calculator takes the hands in your PT database for a given month or date range and calculates the amount of rake you paid at every site you play at. You then fill in the amount of deductions to your MGR that are expected for bonuses etc. and the rakeback percentage that you receive. You'll get an extremely accurate estimate of how much rakeback you have earned. The "buddy" finder is a neat feature that many people will overlook. It can help you uncover fish that you have played against so that you can seek them out in the future. The filtering criteria is uses are the player's VP$IP (voluntarily put money in pot, basically a gauge of how loose a player is) and their aggression factor (to find calling stations). It can be very profitable to do a quick player search for a few key fish when you're just starting your session and then jump into any games they might be playing. This software was designed for very early versions of PokerTracker. It's important to note that PokerTracker now has superior graphing capabilities to what is available in this free add-on for PT's earlier versions.